Folkestone Harbour station during reconstruction c1895. The new pier seen here was brought into use in 1863 because some larger steamers had difficulty berthing at the South Per at low tide; a new pier platform was opened in March 1876. The 1881-83 extension to the pier is seen beyond the station. The trainshed has been extended and slewed over to the east allowing the rails to be extended onto the pier. The carriage berthing sidings seen running along the beach on the left were laid in 1893 with a trailing connection to the up line between the pier and the trainshed. Within a few years the trainshed would be demolished as part of the rebuilding of the station. The second engine shed with its adjacent lean-to is seen behind the south end of the trainshed. 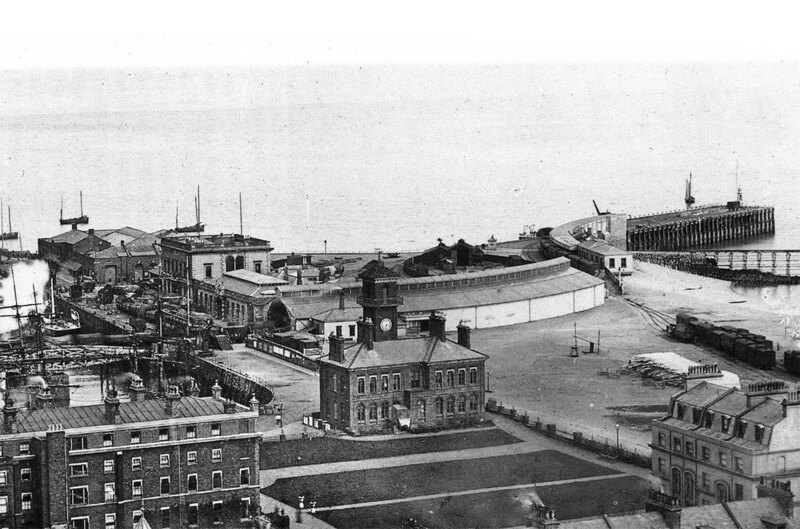 The Royal Pavilion Hotel is seen bottom left; in 1899, Harbour House, (bottom centre) was demolished to allow the hotel to be extended.